I am so excited for today's post! From the moment I started seeing pictures of the OPI Tokyo Collection I knew that I had to have it. As soon as it popped up I grabbed it and now I get to share it with you guys. Before we get into the swatches, let me know if you want to see some comparison swatches with these shades and I'll do my best to do them in the next couple of weeks. Right, lets get into the pretties! All Your Dreams In Vending Machines is an electric pink shimmer. I absolutely love this colour and think that it's stunning! The formula is a little patchy on the first coat, but does even out on the second coat. I used three coats for my swatch as I found it a little see through at the tips for my liking. Sadly, this polish stained my nails after I removed it (I had it one for just under 24 hours). Another Ramen-tic Evening is a dusty rose creme. I love this one too. I think it is such a pretty colour (you'll probably hear me say that about a lot of these polishes). The formula is easy to use but is a little uneven on the first coat. It does even out beautifully on the second coat, which is what I used for my swatch. Arigato From Tokyo is an orchid creme. It's going to come as no surprise that I love this one too! The colour is gorgeous and the formula is fantastic! My swatch shows two coats. Chopstix And Stones is a cobalt blue shimmer. 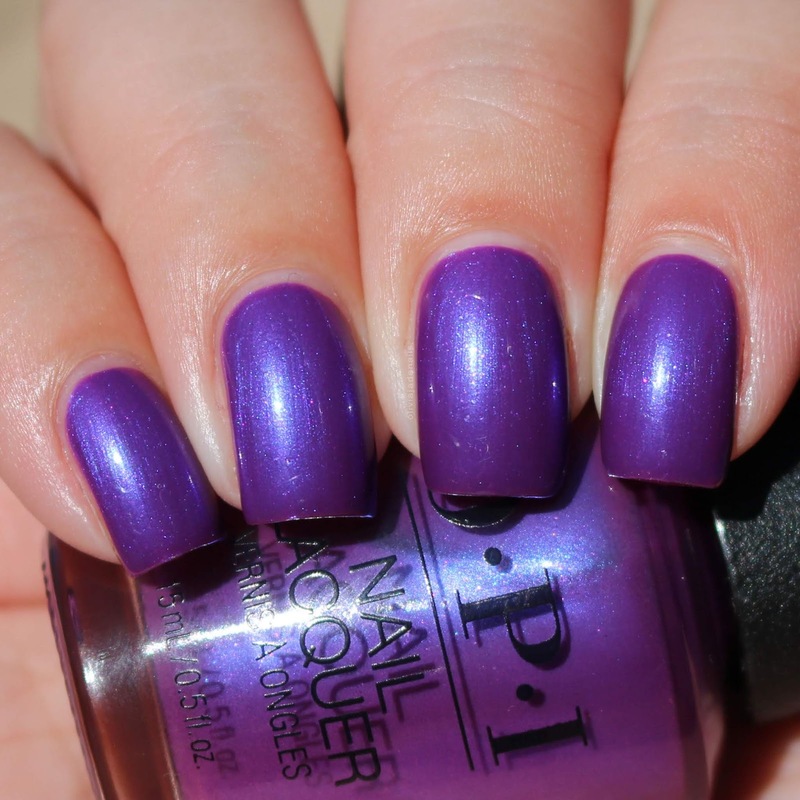 I absolutely love this one but this is one of those polishes that doesn't translate so well to pictures. It is a much deeper and richer colour in person that it shows in my pictures. It also has a glow about it. It's stunning and the formula is amazing. My swatch shows two coats. How Does Your Zen Garden Grow? is a lime green creme. This may come as a surprise, but I love this colour! It's bright and fun. Definitely great for summer. The formula is easy to use but it is a little uneven on the first coat. I used two coats for my swatch. Hurry-juku Get This Color is a berry pink creme. I love this one too! It's gorgeous! The formula is amazing and you could get away with one coat. My swatch shows two coats. I'm On A Sushi Roll is a teal creme. I'm a big fan of this one too. The colour is so pretty and the formula is great. It too is close to being a one coater. I used two coats for my swatch. Kanpai OPI! is a periwinkle blue/grey creme. I am so in love with this colour! I don't think I have anything remotely close to it in my collection. I think it would also look amazing mattified! The formula is fantastic and is opaque in two coats. Rice Rice Baby is a mauve creme. I'm really not sure if I like this colour or not. It leans a little too "mature lady" if you know what I mean. Maybe it would be better in some nail art? I guess I will have to play with it and see. The formula is great though and opaque in two coats. Samurai Breaks A Nail is a lilac shimmer. This is one of the polishes that drew me to this collection and it didn't disappoint. I love the colour. It's truly stunning. The formula is a little on the sheer side, and is patchy. I used three coats for my swatch. Suzi-san Climbs Fuji-san is an emerald creme. This one definitely seems more teal to me than emerald to me, but what ever you want to call it it is a pretty colour. It doesn't look as blue in person as what my camera makes it look though. The formula is amazing and you could easily get away with one coat. My swatch shows two coats. Tempura-ture Is Rising is an orange creme. This isn't a favourite of mine but I think it's great for nail art. It's a good summery colour. The formula is patchy and needs three coats to even out, which is what I used for my swatch. I love this collection! It is definitely one of my favourites that they have done. The colours are great (and no reds for those of you who think that that is all that OPI do) and the formulas are great (for the most part). I am a little disappointed that All Your Dreams In Vending Machines stained my nails. The colour is so gorgeous that it wouldn't stop me from wearing it again. I'm not sure that I can pick favourites from this collection so I'm not going to. What do you think of the OPI Tokyo Collection?